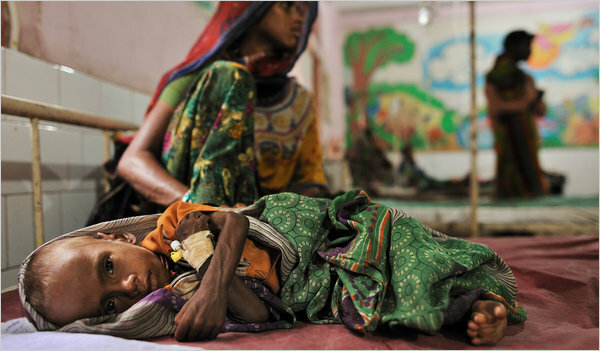 From The New York Times – By JIM YARDLEY – 8/08/2010: JHABUA, India — Inside the drab district hospital, where dogs patter down the corridors, sniffing for food, Ratan Bhuria’s children are curled together in the malnutrition ward, hovering at the edge of starvation. His daughter, Nani, is 4 and weighs 20 pounds. His son, Jogdiya, is 2 and weighs only eight.